At the top of my list of things to do while in Malaysia this time around was to dive the island of Sipadan. Sipadan is considered one of the best dives site in the world. So I booked us on a 6 day/5 night package at Borneo Divers Mabul Resort. Mabul is the island next to Sipadan. You can’t actually stay on Sipadan as it’s now protected and visitor numbers are limited. There are four other places you can stay. The Sipadan Mabul Resort (SMART) runs a high end Water Village as well as some value-oriented beach bungalows. There’s another water village at Kapalai and there’s an old converted oil rig platform called SeaVentures which offers good value for money. A fifth option which the cheapest of the lot is to stay in Semporna on the mainland but then you have a long boat ride out to the islands. I was very happy with the Borneo Divers Resort. 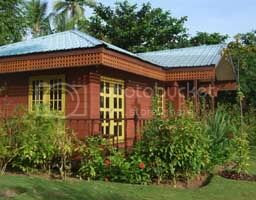 It was well run and the bungalows were bright, nicely furnished and comfortable. The staff were very friendly. The diving kit was a mixed bag: some stuff was new, some was rather old. If I was going to complain, I would say the food wasn’t inspiring. It was perfectly adequate but not a lot of choice. A minor niggle. The daily routine is breakfast by 7:30am and then walk over to the diving station by the beach to put on your wetsuit and boots. Your fins, weights, BCD, regs and tanks are already loaded on the boat so there’s nothing much for you to carry except your mask and computer. The boat leaves at 8am and takes about twenty minutes to get out to Sipadan. It will take up to about 12 people. At Sipadan, you have to first dock while all the permits for the day are checked. Lots of visitors are just there for snorkelling so they get off the boat and then the divers head out to the first dive site. After the dive, we dock again and have a one hour break on the beach. It’s catered with tea, coffee, water and some snacks. Lots of chit chat. Then it’s off for the second dive. The dive master switches all the tanks for you so all you have to do is a predive check and then backwards roll into the water. After the second dive, the boat picks up the snorkellers and we all head back to Mabul in time for lunch. All meals are included in the package. At 3pm, there’s another boat dive but it’s only to either Mabul or Kapalai. 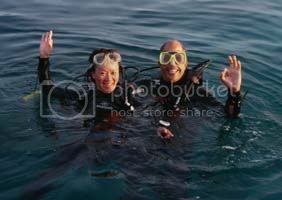 After that, you have the option of doing a (free) sunset dive at the house reef without a guide so you must have a buddy. After your last dive, it’s your job to wash all your equipment with freshwater and get it ready for the next day. Dinner service starts at 6:30 and the night is yours. That’s the routine. I loved it. The diving was very good. I was a bit disappointed at first as I expected to be blown away and I wasn’t. But the diving was very good. 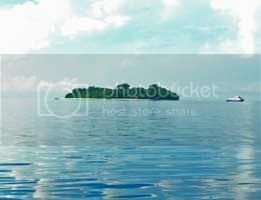 Sipadan is a turtle island. You can’t go there and NOT see a turtle. You regularly see a few on each dive. 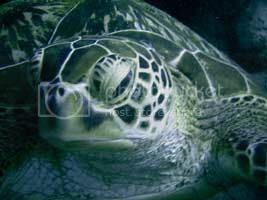 They’re not easily scared by divers so you can approach them quite close as they lie sleeping on the seabed. You get both Hawksheads and Greenbacks. There’s also lots of whitetip sharks. You see them on almost every dive too. I don’t go so close to them! I was really hoping to see a tornado of barrucuda which are often found at Barracude Point but they never showed up. Guess it was the wrong season for them. The other star sighting we had was a large Eagle Ray swimming along the sea floor at about 40m depth. First one I’ve ever seen. Lovely creature. Beside those, there was plenty of other sea life and I must confess I don’t know all the names of them. They’re fish. Tons and TONS of fish. Colouful fish. Little ones and big ones. One fish, two fish, red fish, blue fish. Trigger fish, Parrot fish, Angel fish, Jack fish, Bum heads, Blue Spotted Rays, Alligator Fish, Trevalleys, Flute fish, Pipe fish, Groupers, Bat fish, and bazillions of tiny reef fish. Found a black frog fish. He was cool. Annoyed a Morray Eel. Even got to see a school of cuttle fish. This region has upwards of 3000 species of reef fish. One of the highlights was playing with a large school of Jack fish. Jenny and I managed to hover in the middle of them while the school circled us. Weird having all those eye’s looking at you! The point is that there’s lots to see. There’s also lots of nudibranches and other little things if you take the time to just explore. Even found a pygmy seahorse. So after twelve dives, I was pretty happy with Sipadan. Jenny had a couple of moments while diving. Once, she dived off the boat without putting her fins on first. The DM was standing around looking at an empty boat and calling out “whose fins are these?!”. Of course, no one let her forget that quickly. On the last dive, I noticed my no decompression countdown was getting close to zero. Then I checked Jenny and found she had slipped into a decompression dive. This is something that’s always avoided as you have to manage your ascents more carefully. It was easily sorted by a longer stint at 5m. Overall, the diving isn’t difficult. There are currents but they’re easy to live with. The sea was always very calm with no swell. It can be freaky as you swim over the dropoff knowing that the sea floor is 600m below you. But you can get a wonderful sensation as if you’re skydiving. We visited Turtle Cavern twice and on the second time penetrated inside the cave a short ways and enjoyed the view looking out into the deep. We made some friends during the trip. Divers are a friendly bunch and there’s plenty of time to relax and chat. The pictures I’ve posted here are from Tim and Lana who are a Canadian couple we met. So I would recommend diving Sipadan but I probably won’t go back unless it’s a great deal. I want to dive Layang Layang with the hope of seeing Hammerhead sharks. Or I’d like to go somewhere to see Manta rays. 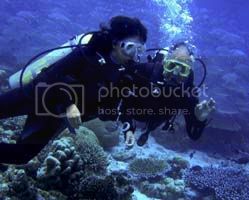 Asia has so many good places to go diving!